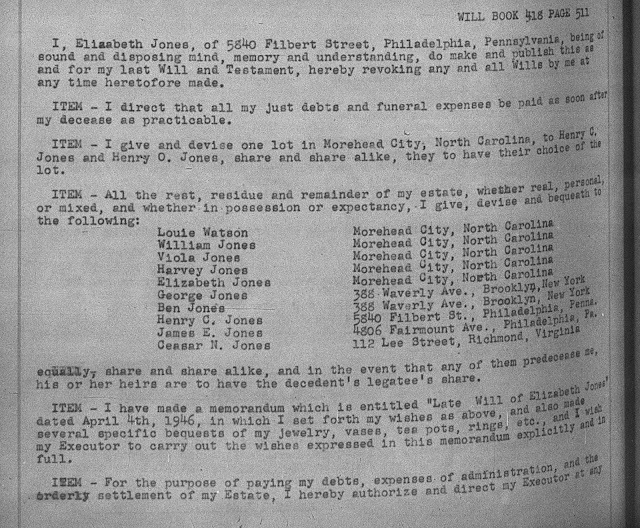 Who Were The People Listed In Elizabeth Jones's Will? Now you are probably wondering who were all these people? Here's a refresher on the Jones family line. This is well help show how everyone was connected. To this union the following children were born. Now back to Elizabeth's will. The relatives listed in it were her nieces and nephews. Louie was actually supposed to be Lovie. Lovie Watson was the daughter of Alexander Hamilton Jones. Viola Jones was Harvey's daughter. The great thing about this will is that I lost track of the individuals who left Morehead City when they grew up. Here were addresses! At last, they were found.